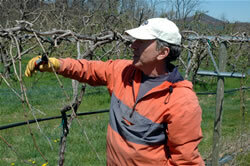 Late Winter/Early Spring (March/April) – During the occasional mild day, we prune for the coming year’s growth. 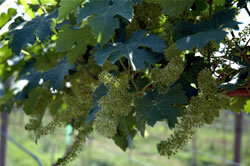 This sets up the vines for maximum renewal and long-term yield. The dormant vines appear on first approach to be lifeless, but the first snip reveals green tissue waiting for the spring sun. 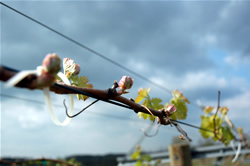 Bud Break (April) - Nothing is quite as exciting in the vineyard as spotting the tiny shoots emerging from winter’s dormant buds! (You’ll have to excuse our enthusiasm—we are grape growers.) A new season of growth will soon be upon us. Left alone, the vines would tend to sucker and sprout shoots all over the place, so we need to rub off unwanted sports. Bloom (June) – In early summer, grapevines set inconspicuous little flowers that are self fertile—no insects needed for pollination. There will be some bees in the vineyard, mostly in the succulent clover that is planted in certain spots to fix nitrogen in the soil. Even though the flowers are small, the bouquet is permeating—much like orange blossoms, if you’ve ever had the experience. At bloom time, we need to lower the swing arms to direct shoot growth in the most appropriate direction. This will ensure that each leaf gets its fair share of sunlight throughout the rest of the growing season. 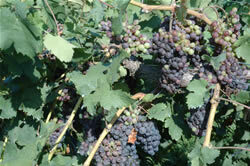 Veraison (August) – Veraison (vehr A’ zhun) is a French word for coloring. In the heat of summer, the shoots will slow or cease growing entirely, the leaves begin directing the energy of photosynthesis into ripening the berries that now start to turn color. At veraison, we need to pass through the vineyard and remove shoots that are not growing well, or remove selected clusters to allow the remaining clusters to fully ripen—a little bit of “tough love.” . Harvest (September/October) – Bud break is exciting, but harvest is fulfilling. All the work of the year to date manifests itself in those clusters of little berries hanging neatly on the vine for us to clip. Some of the leaves will have turned yellow, bronze, and burgundy (where do you think they got the name for that hue?). Each cluster gets dropped into a lug (now there’s an indication of the labor involved), lugs get emptied into bins, and the bins get driven to a waiting winery. 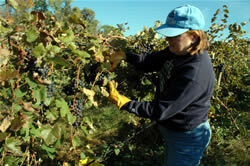 Harvest and crush time is the busiest time of the year for both the vineyard and the winery.